Sony’s Xperia Z3 Compact, a flagship type phone in a much smaller than normal body, is now available for purchase in the US as an unlocked device for $529. Sudden availability is a little surprising, if I’m being honest, as Sony tends to take their sweet time bringing newly announced phones to our shores. While we weren’t expecting the Z3 Compact to arrive at a carrier near us, the phone as an unlocked model seemed like something that wouldn’t be arriving for months. Thankfully, our gut feeling was wrong there, because this is an awesome little phone, for the most part, especially if you are into smaller phones. As a recap, the Xperia Z3 Compact is a flagship-level phone that lives in a smaller body, typically reserved for phones with a “mini” tag attached. The Xperia Z3 Compact is no “mini” though, as it features a Snapdragon 801 processor, 2GB RAM, 20.7MP camera, water resistance, and supposed 2-day battery life. If it has one downside, it would be the 4.7-inch 720 display, but I can tell you that after using it for a few weeks now that I have no complaints. The biggest selling point of the Xperia Z3 Compact for me has been the size. “Compact” in this case does indeed mean smaller, but again, this isn’t a “mini” like you would get from Samsung. The Compact is every bit as powerful as its bigger sibling, the Xperia Z3, it just has a smaller display and a smaller, much more manageable body. This phone feels great in hand, looks great, and for the most part, performs well. I’ll have my Xperia Z3 Compact review up within the next day or so, but I can tell you now that I have mostly great things to say about this phone. Check out our unboxing and how it compares to the new iPhone 6 before then. 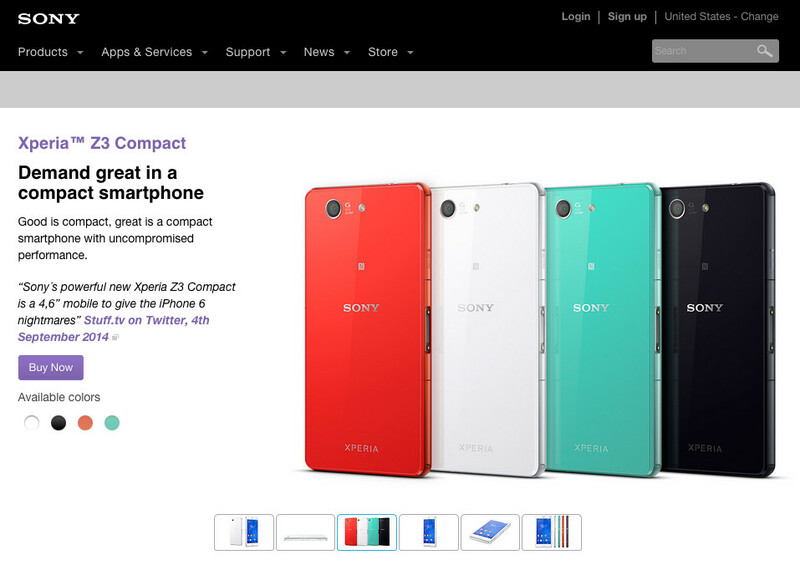 To buy the Xperia Z3 Compact in any of four colors (orange, green, white, or black), hit up the link below. The device should work just fine on both AT&T and T-Mobile networks.